Inventos folgte den US-Rappern Dead Prez und Tony Touch, welche 2005 die Orishas auf Kuba besucht haben, exemplarisch zeigt der Film die ersten Gehversuche von Hip Hop auf der Insel. Das Wort Inventos, ist der Titel dieses Dokumentarfilms und bedeutet, aus nichts etwas zu machen, in der Weise wie kubanische Bands genommen haben was sie hatten um auf der internationalen Bühne bekannt zu werden. Das Wort Inventos bezeichnet auch die Entstehung des Films, da dieser ganz ohne Skript und ohne Finanzierung entstand, nur mit einem starken Wunsch zu dokumentieren, was in Kuba mit Hip Hop passiert. Der Film bietet einen einzigen Einblick in die Realitäten und Politik des zeitgenössischen Kubas und begleitet Pioniere dieser musikalischen Bewegung in ihre Häuser, zu ihren Auftritten und bei ersten Reisen ins Ausland. So wie Hip Hop in den USA, als eine Form der kreativen Selbstausdruck begann, brachte er auch in Kuba ein neues Bewusstsein zu drückenden sozialen Bedingungen, und zeigt den innovativen und unzerstörbare Geist von einem Volk, dass vom US-Embargo unterdrückt wird. Inventos dient als Erinnerung des politischen Bewusstseins, wodurch diese Musik geschaffen wurde. Dreißig Jahre nach seiner Erfindung gib Hip Hop trotz Kommerzialisierung weiterhin Menschen eine Stimme, die nicht schweigen wollen. Der Film zeigt, wie sowohl Kuba und die USA ähnliche soziale Kämpfe durch Hip Hop reflektieren und was passieren kann wenn kulturelle Barrieren überwunden werden. Der Film erweckt eine Oldschool -Essenz, die unsere heutige Generation inspirieren, und ihr die Augen öffnen soll. Eli Jacobs-Fantauzzi is a graduate of Tish School of the Arts at New York University. 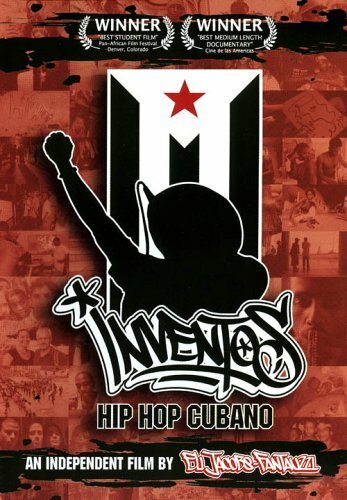 Eli’s first full-length film documentary,”Inventos: Hip Hop Cubano”, premiered in Havanna, Cuba and has toured successfully across the U.S.
Cuban Hip Hop provides a unique insight into the realities and politics of contemporary Cuba. Experience this as Inventos follows some of the pioneers of this musical movement to their homes, the stage and as they travel abroad for the first time. Inventos embodies the true spirit of Hip Hop, which is to build something that is powerful and useful out of what is seemingly impossible. Just as Hip Hop in the U.S. began as a form of creative self expression bringing awareness to oppressive social conditions, Cuban Hip Hop demonstrates the innovative and indestructible spirit born from a people suppressed by the U.S. embargo on Cuba. Inventos, serves as a reminder of the political consciousness through which this music was created. Thirty years after its conception, and in spite of commercialisation, Hip Hop culture continues to give voice to people who refuse to be silenced, ignored and cut off from the larger society. The film shows how both cultures reflect similar social struggles and if brought together, could transcend cultural barriers and build a collective community dedicated to spreading messages of truth and empowerment globally. Jacobs-Fantauzzi’s film rekindles an essence of the old school, which will inpsire and reawaken the eyes of our present generations.